Elvis Enthusiasts Unite: Bring it back. A week ago today, I took a young pine cone from the mountains of Utah, threw it in my bag and claimed it a souvenir of sorts. There were so many there to spare already and my friend and I had broken so many of them in half, our hands ended up impossibly stained by the sweetest smelling sap I can remember having experienced. Even as I traveled those couple thousand of miles back, that sap remained on my fingers; I wasn’t entirely eager to wash it off. The goal was that, in my darker times, I might be able to break it in half and breathe in a little of that blink of a visit, that it might take me back to the kind of outdoors I adore so much. 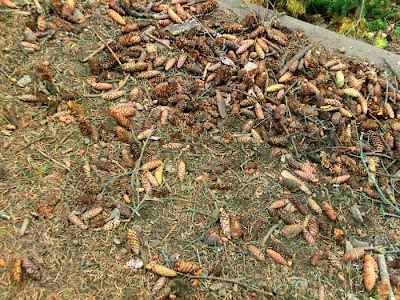 Now, just a few days later, that same pine cone is falling apart, shedding pieces of bark and such all over my place, protesting my having taken it from there to here. That, or it’s choosing to spread itself further than it ever would have on a dirt floor. I don’t want to break it in half, either, not now and maybe not at all. Besides, it seems it’s on its way out as it is. I hate to look into the future any further than I have to, but I already know this will be a truth of mine to add to the others: I’ll miss that little pine cone.